Military leaders in Thailand have staged a coup, suspended the constitution and declared martial law. Army chief Sonthi Boonyaratglin said the military leadership had formed a council for political reform and ousted the Prime Minister, Thaksin Shinawatra. The coup leaders say the cabinet and parliament have been abolished, but power will be returned to the people. Mr Thaksin cancelled a speech he was due to give at the UN. It is unclear whether he intends to return home. The military said the country's stock market, banks and schools would remain closed on Wednesday. BBC World, CNN and other international TV news channels have been taken off the air, while Thai stations have broadcast footage of the royal family and patriotic songs. 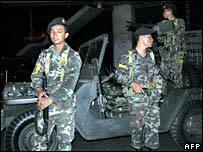 In the capital, Bangkok, soldiers seized government offices and took up strategic positions around the city. In a broadcast on all Thai television channels, the leadership of the armed forces said it had taken control of Bangkok, declared nationwide martial law and ordered all troops to return to their bases. "We ask for the co-operation of the public and ask your pardon for the inconvenience," the announcement said. A spokesman for the coup leaders, Gen Prapart Sakuntanak, said the seizure would be temporary and power would be "returned to the people" soon. The military announced that regional commanders would take charge of their areas outside Bangkok. It ordered provincial governors and heads of government agencies to report to them in the coming hours. The rebels - who said they were led by Gen Sonthi - visited the king and declared loyalty to him. The highly revered King Bhumibol Adulyadej has made no comment about whether he backs the takeover attempt. There has been pressure growing on the prime minister to resign, including from groups close to King Bhumibol, following a political impasse in which April's general election was declared invalid. But the BBC's Jonathan Head in Bangkok reports that while many people wanted Mr Thaksin out of office, there will be unease about the way this has happened, and people will be looking to see whether the king has supported the coup. Opposition Senator Mechai Viravaidya welcomed Mr Thaksin's departure, despite doubts about the methods used. "I'm delighted he's gone," he said. "It would have been great if he had resigned voluntarily, but apparently he was too stubborn. But at least it's better than an assassination." Another opponent of the prime minister, Chirmsak Pinthong, suggested that Mr Thaksin's continuation in power would have been even worse. "I would say that nothing is worse than what Thaksin has done," he said. "Thaksin has already carried out what I would call a silent coup, because he called the country as a dictatorship by using money in a corrupt way. "Nothing is worse than the Thaksin regime." Our correspondent says the coup is a surprising development for a country that had been viewed as one of Asia's leading democracies, and events in Thailand will have repercussions throughout the region. The streets in Bangkok were quiet on Tuesday night. People were calm for the most part, correspondents say, curious about what was going on, but some said they were scared. Traffic moved through the streets normally and in the bars of the city centre, foreign tourists seemed oblivious to what was going on. One soldier on a tank said: "We don't know why we're here, we've been told to say nothing. We're just following orders." Russell Miles emailed the BBC News website to say there were troops "dressed in Swat-style gear strolling around" near Government House, and "a tense, but fairly controlled atmosphere". He said: "We saw a group of blokes bundling a cameraman and another chap into a van. We are taking photos, but not out in the open." The EU's Finnish presidency expressed "grave concern" at events, and the US called on Thais "to resolve their political differences in a peaceful manner". It is the first coup attempt in 15 years in a country where they used to be commonplace. There were 17 of them between 1932 and 1991.